The food is just so good that you can't stay away. Me and my mother specifically like the kofta kebab because truly it is one of the best I have tried while living in London. The restaurant also provides free starters, tea and baklawa!! the only thing that scared te life it of me is that twice now I have seen cockroaches!!!! I spoke with the Staff and they reassured me that they would take care of it. I recommend going on the week days as it's not as busy (Mon-Thu). Avoid Friday to Sunday! Too busy!! 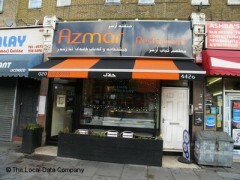 The best Kurdish restaurant in London. Amazing food, lovingly cooked, with a great homely feel to the service. Smiling and helpful waiters, lovely kebabs (best kebabs are Kurdish), hot and tender naan bread fresh from the oven. Food at its simplest and finest. I love it! Came here as a one off quick lunch, was very satisfied, staff had smiles at all times, the food was some of the best food I've tasted! And they give extra dishes! Absolutely loved this place, can't wait to visit London and pop in again! Stayed by restaurant for work and thought they needed a review as none.so far. Great meal, tasty and filling with friendly staff. Don't be put off when they bring you extra to what you ordered, this wasn't charged extra. Meal and a drink for 11 pound. Walked away full and satisfied! Very pleased! !